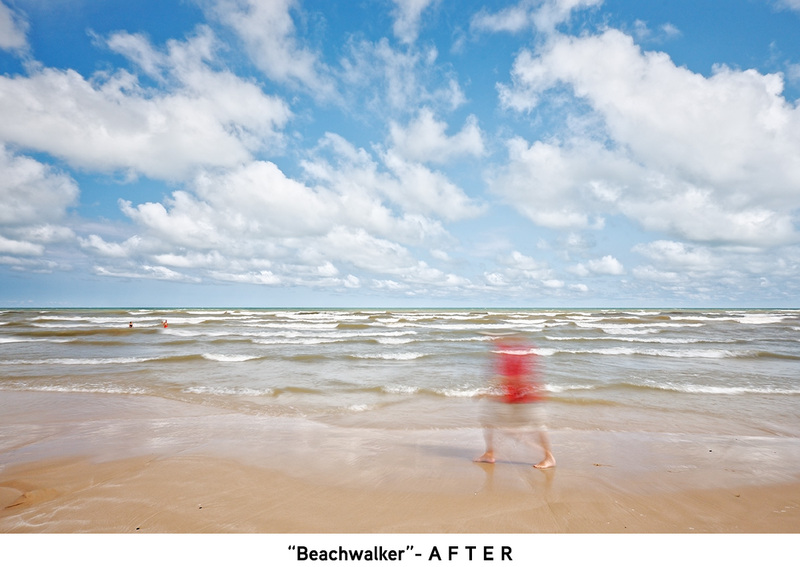 This shot at Ipperwash Beach, Ontario, demonstrates the limitations of your camera's light meter (and also of this photographer!). Most scenes contain areas of widely varying "luminance" (a technical term roughly equivalent to "brightness"). In this shot you have the bright whitecaps and clouds, and the much darker sky, water and sand. Your eye makes sense of it all, but the light meter only computes the average value of brightness in the scene. So for example when you shoot a snow-covered landscape - a scene dominated by brightness - your camera's "automatic" setting makes the snow look gray. The meter is programmed to set an exposure that brings the average level of light in the scene down to a predetermined level. I was concerned about the opposite effect here - i.e. that the dominance of dark areas would cause overexposure the light areas - the clouds and whitecaps. So I set the exposure in the BEFORE image a couple of f-stops lower than the meter reading. But I went too far, because the whole image - even the light areas - is underexposed. In the RAW file I corrected the exposure while keeping an eye on the luminance histogram showing the distribution of luminance across the full range of tones (from darkest to brightest). The histogram told me I was slightly overexposing the whitecaps - which I wasn't worried about because there wasn't a lot of detail in them to be preserved anyway. 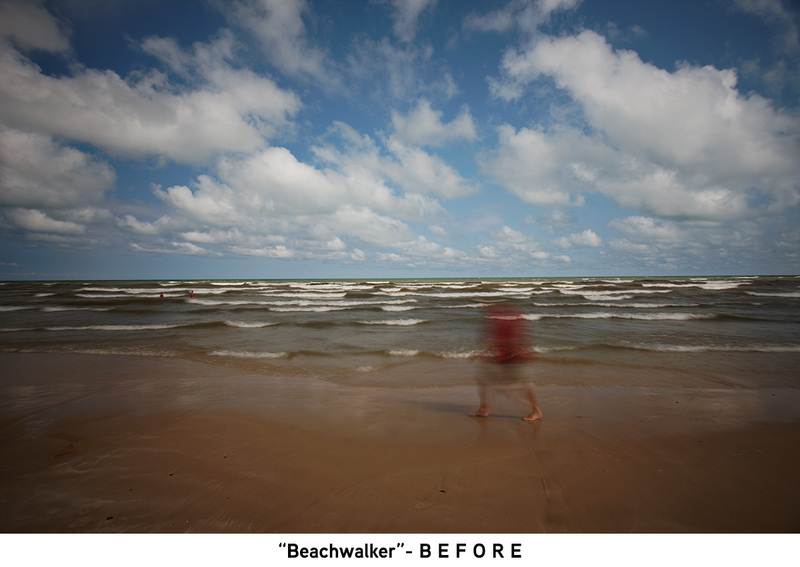 The benefit of doing this was getting a desirable amount of brightness in the rest of the AFTER image. Brightening the image washed out the color of the man's red shirt, so I isolated the shirt and increased vibrancy in that area only. The BEFORE image had a slight tilt downward to the left. I corrected this with a horizon adjustment. I also corrected a slight bluish color cast in the BEFORE image with a color temperature adjustment. I cropped from the bottom to reduce uninteresting foreground. Notice how pronounced the vignetting (darkening around the edges) is in the BEFORE image. This was easily corrected with a vignetting adjustment to the RAW file. To create the dreamy effect of the blurred, headless man, I set a shutter speed of 1/3 of a second.